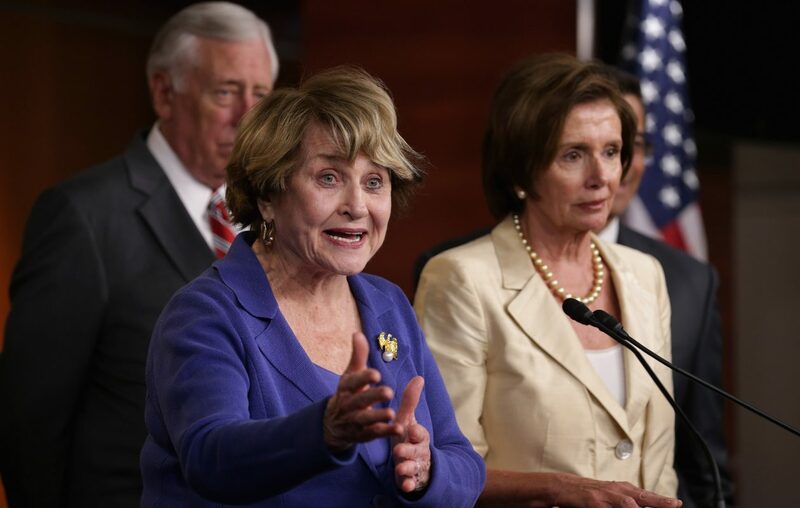 WASHINGTON – Rep. Nancy Pelosi walked into the Capitol on her first day in Congress in 1987 and quickly encountered a lawmaker who had just arrived in Washington a few months earlier: Rep. Louise M. Slaughter, the Rochester-area Democrat with an incongruous Kentucky drawl. "I said her reputation has preceded her, because Governor Mario Cuomo had over and over again sang her praises to me: 'Wait until you meet Louise'," Pelosi told The Buffalo News in an interview Friday. "I had very high regard for Governor Cuomo, and therefore I loved Louise even before I met her." And so began a professional partnership between two beginning lawmakers who would together grow into two of the most powerful women Congress has ever known. Pelosi, a California Democrat who won a special House election shortly after Slaughter won her first term, would shoot up the Democratic hierarchy farther and faster, serving as the first woman speaker in 2007 and continuing as minority leader today. But Slaughter, who died Friday at the age of 88 after suffering a fall and a concussion last week, stood at Pelosi's side during many of the most important moments of Pelosi's career, and through many of the House's most historic moments of the past three decades. Speaking with The News, Pelosi reflected on the colorful character from upstate New York who became her ideological partner and a top lieutenant. And like many who recalled Slaughter Friday, Pelosi described her as a persistent and effective legislator with a heart. Two women trying to make their way in a male-dominated institution, Slaughter and Pelosi quickly bonded. Both became leaders in the fight for women's rights, with Slaughter taking particular pride in representing Seneca Falls, birthplace of the women's rights movement. "She took ownership of Seneca Falls and everything that happened there, and felt a responsibility to praise those women and stand on their shoulders and enable other women to stand on hers," Pelosi said. Pelosi noted that Slaughter had the doggedness to get work done in an institution where success can come slowly. "When she dug into her heels, if you just wanted to save time, just do what she wants, because she's not going to go away," Pelosi said. For example, Slaughter worked for more than a decade to win passage of a bill banning discrimination based on a person's genetic makeup. That, Pelosi said, serves as evidence not only of Slaughter's persistence, but of her background as the only microbiologist to serve in the House. "She didn't flaunt it, but she used her education credentials and her degree in microbiology to to affect public policy," Pelosi said. Slaughter fought for and won the first $500 million in federal research money for breast cancer, and led a long fight against the overuse of antibiotics in farm animals. And, as chairwoman of the House Rules Committee, Slaughter not only guided the Affordable Care Act to the House floor, but also used her powers of persuasion to line up votes. Pelosi chose Slaughter to hold that powerful post, but not just because they were personally close. "She was the best, with her command of the issues and the knowledge of the rules and the respect she commanded on both sides of the aisle and certainly with those who came to testify," Pelosi said. That respect was born not just of knowledge, but of warmth. A former jazz singer, Slaughter would sometimes fight with Republicans by day and sing at charity events they were involved in at night, Pelosi noted. "She brought harmony into the most raucous relationships," she said. "If she was your friend, there was a loyalty to behold." That being the case, Slaughter's death brought about an unusually large number of heartfelt statements from Democrats and Republicans alike Friday. "She had friendships across the aisle, across the Capital, down Pennsylvania Avenue," Pelosi said. And all those friendships helped Slaughter build a lasting legislative legacy. "As I have often said before, there are many Southern belles whose accents have helped them get their way," Pelosi said. "Louise got her way all over the country."